As a Brit, I know only too well about the fanaticism surrounding football. I have been lucky enough to attend a few matches in Latin America and I have to say, NOTHING prepares you for the experience! It’s an absolute must for any sports fan visiting this part of the world! 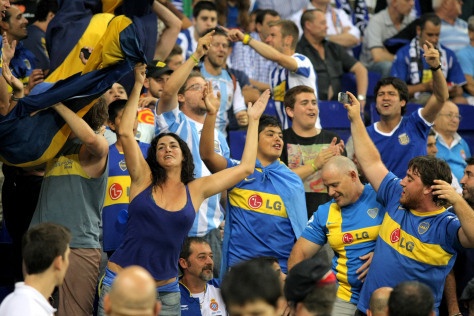 In this post Chimu Adventures consultant and football fanatic Karel Topic describes his amazing experience at a Boca Juniors match in Buenos Aires. As long as I can remember, I’ve been football mad! So, when I spent a few days in Buenos Aires, I couldn’t pass up on the chance to see a traditional South American match. I had to see the electric atmosphere that everyone describes for myself! Boca Juniors is easily the biggest club in Argentina. 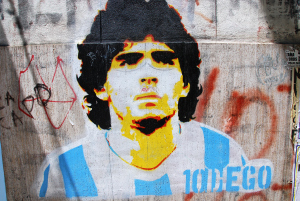 They are one of the most successful and once the home of legendary and infamous Diego Maradona – still one of their biggest fans. Sunday evening is the time when all true Boca Junior fans congregate at the colossal La Bombonera stadium in the La Boca suburb of Buenos Aires. It truly is a sight to be seen! Everywhere you look people are adorned with the club colours; yellow and blue. Caught up in atmosphere and excitements of the day, I suddenly realised I didn’t have a penny on me. There were no cash machines and couldn’t pay by card for my tickets! Imagine my dismay faced with the prospect of missing this experience of a lifetime! I must have looked pretty desperate, as I wondered around trying desperately to figure out what to do. A Dutch guy stopped and asked me if I was OK. I explained my sorry situation. To my shock, but overwhelming relief, he took pity on me and said he would buy me a ticket! I couldn’t believe his generosity or my luck! He bought us both a ticket and we were game on!! As I entered the ground, I stopped to take it all in. The stadium was enormous! Brightly coloured blue and yellow with steep seating along the sides, it has capacity for 50.000 spectators. The game I attended was Boca Juniors vs Gymnasium and had roughly 35000 spectators. No one seemed to care that Boca aren’t doing too well this season, the fans were going crazy. The standing areas were completely full of fanatical fans , who started singing a good 30 minutes before kick-off. The atmosphere was amazing during the whole match; fans sang without stopping and soon after the opening goal the vibe was so intense, that without realising I became a Boca fan too. The pride was almost palpable as Boca scored their fourth goal of the day. At the end of the game there was a big celebration which spilled out into the streets as the fans reveled in their victory. It was a wonderful thing to be part of. I can’t think of anywhere better to experience true Argentinean passion! I now feel like a true Boca fan and I’ll certainly be arranging my next trip around the home games! And the end of the story? Next day I went and found the Dutch man in his hotel and paid him back for my ticket.